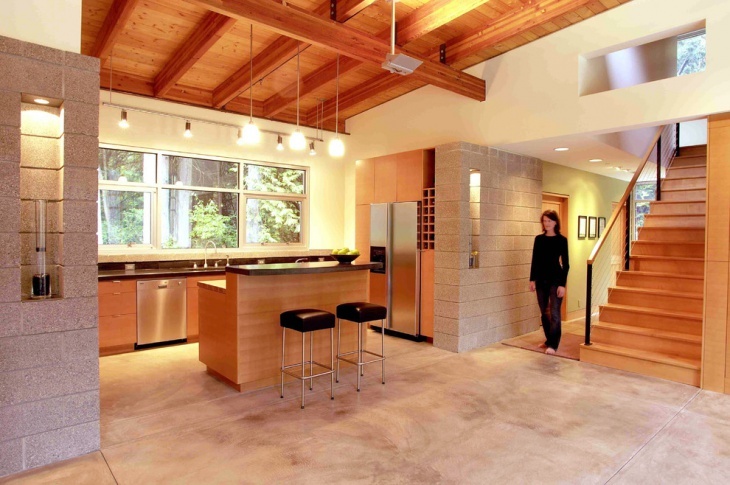 Concrete flooring is the choice of many households. 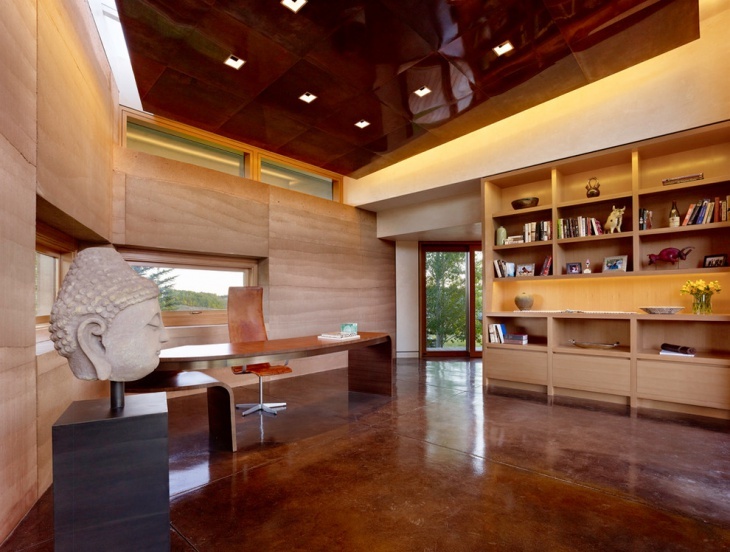 It can take on polished sheen and color, which provides the beauty for the space it is used. It retains heat, keeping the room or home warm during winter. 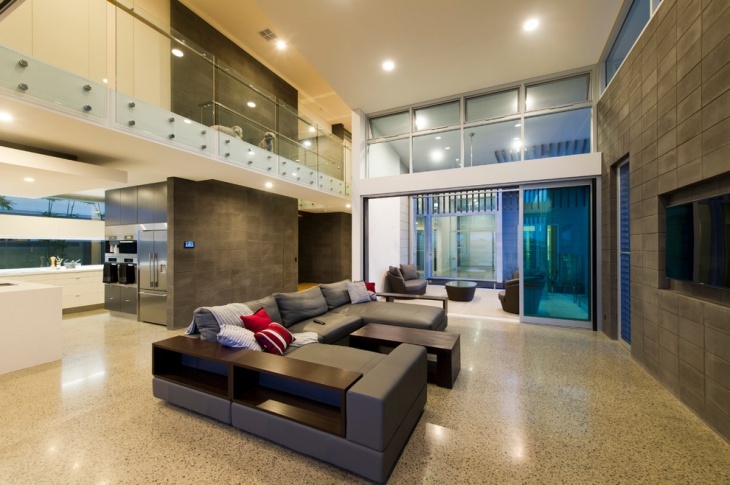 With the right treatment, your concrete floor can be just as elegant and beautiful as a wooden floor. This open plan home is perfect for an active family, with easy access to living, dining and kitchen areas. 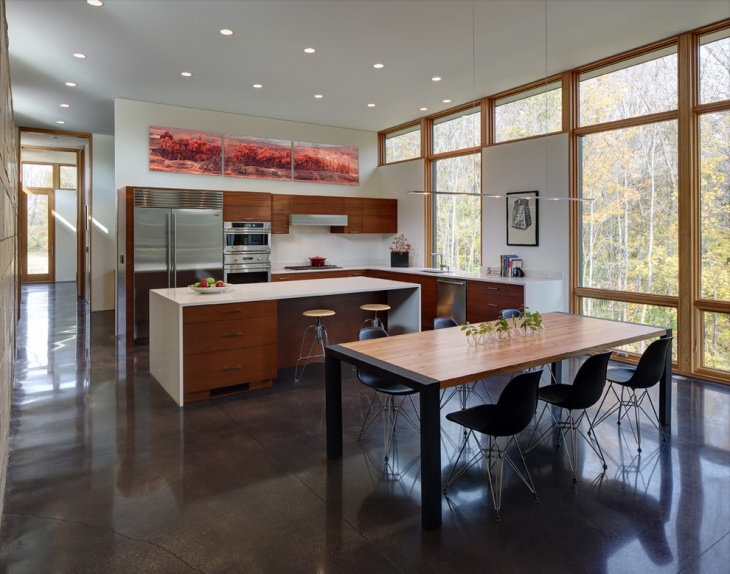 The polished concrete flooring retains the heat in cold months. 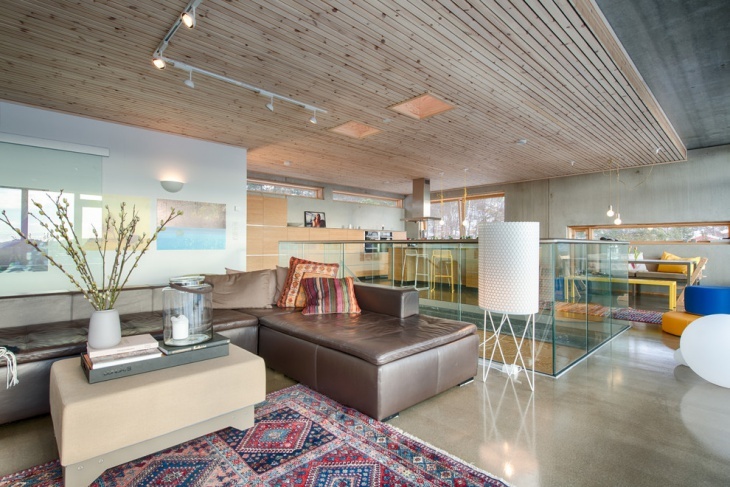 To soften the concrete look, a beautiful and colorful rug is used for the living space. 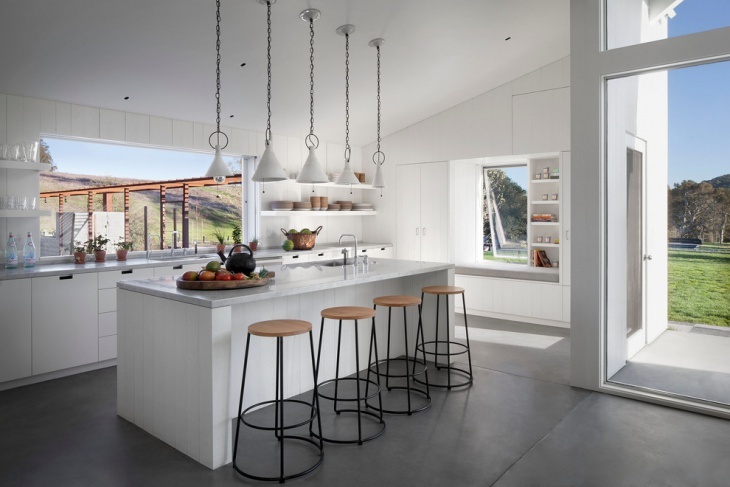 For this farmhouse, concrete flooring provides a great base for the white motif. This kitchen looks so simple yet elegant because of the simplicity of the floor design. The white color perfectly balances off the grayness of the floor and the countertops. 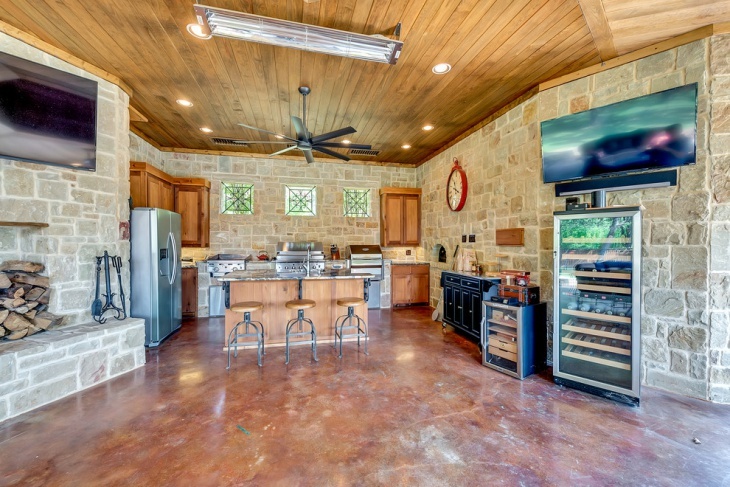 The rustic look of this home is something that anyone would want to copy in their own home. 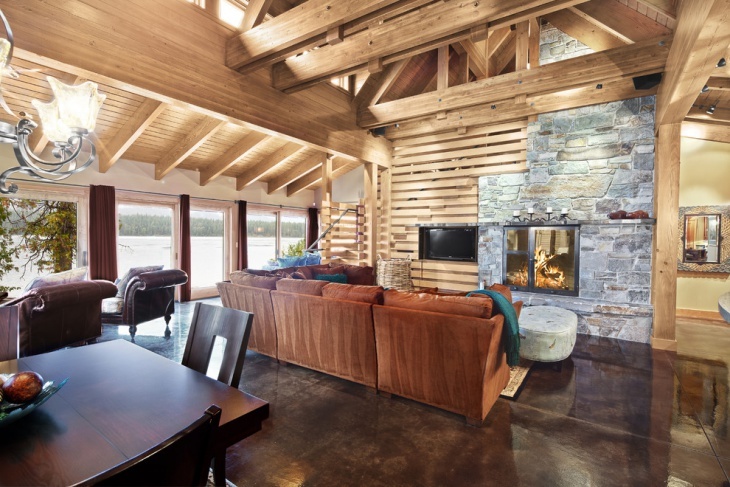 Exposed beams, low ceiling, wood and stone wall, and wooden concrete flooring – these are the elements that make this home a contemporary masterpiece. Concrete flooring for a bedroom is an absolutely great idea. It gives the room some character. 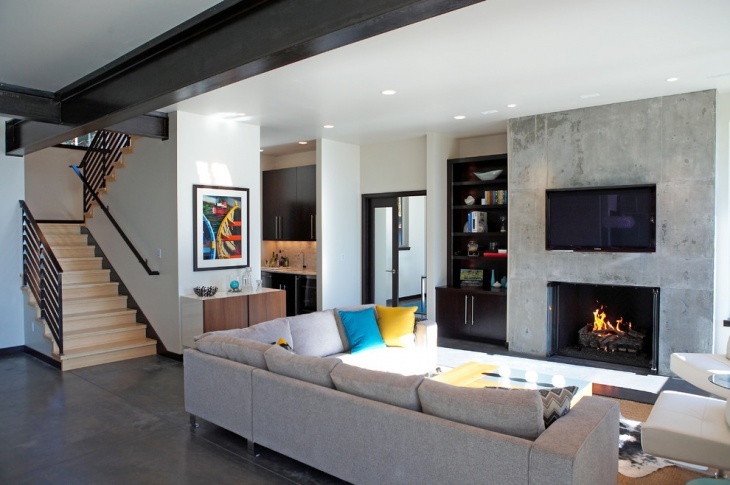 For this masculine bedroom, the dark gray polished concrete floor is just the perfect choice. It provides a good base for the minimalist look and a nice manly touch that matches the black wooden platform of the bed. 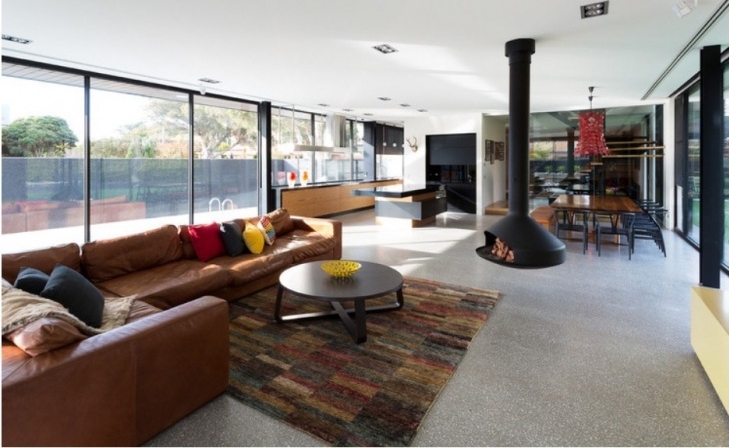 This stunning home is made more beautiful by the use of lightly polished concrete flooring design. The space is totally mesmerizing because of the open plan. The dark gray furnishing and kitchen appliances perfectly balance off the light colors used for the ceiling kitchen cabinets and of course the floor, while the living space walls provide an ideal match. 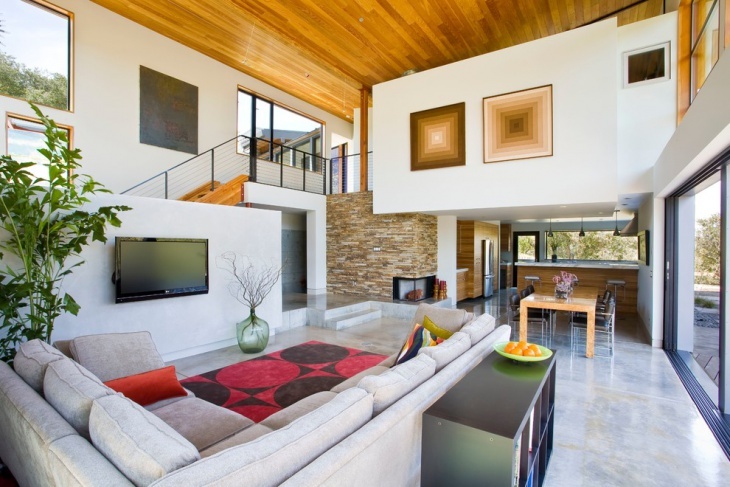 This home interior is the perfect example of well-balanced texture. 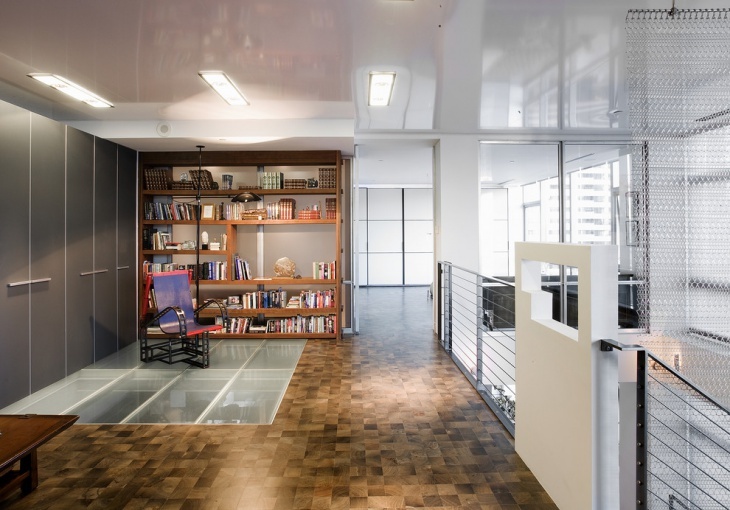 The ceiling is made of polished wood that creates a nice balance for the white polished concrete floor. This brown and white combination is all over the place – white sofa, white walls, brown splashback wall, light brown wooden island base (for the kitchen) and table (for the dining area), and wooden stairs. For a kid’s bedroom, concrete flooring can provide a polished and clean base for the furnishing. This particular bedroom has a simple design, with a bed and two side tables. The brown polished flooring extends to the bathroom and matching the light gray walls and dark colored ceiling. This living room also serves as an entertainment area for the family. 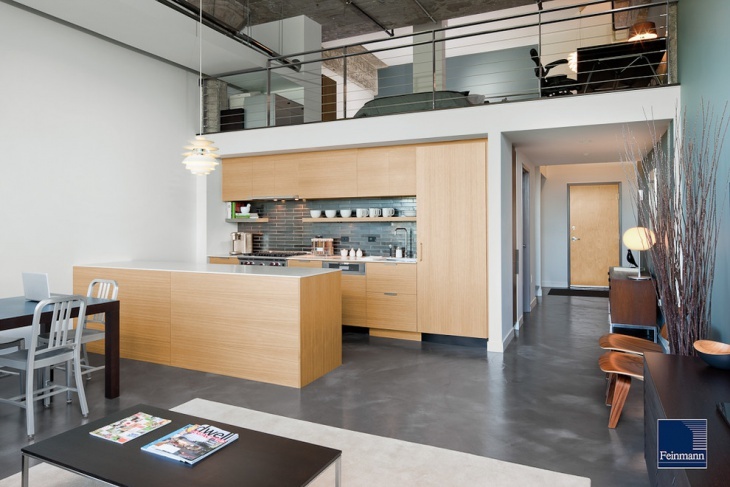 The room has an open plan design as the living space leads directly to a small kitchen. 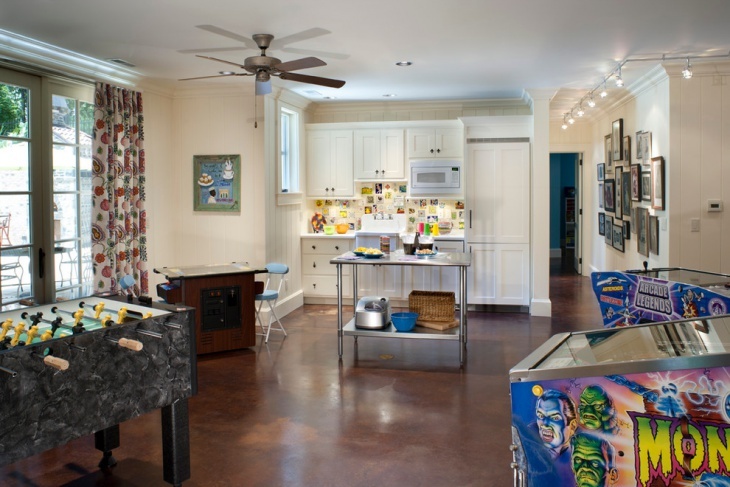 Arcade games provide the entertainment, while the polished concrete flooring gives the room a clean look. 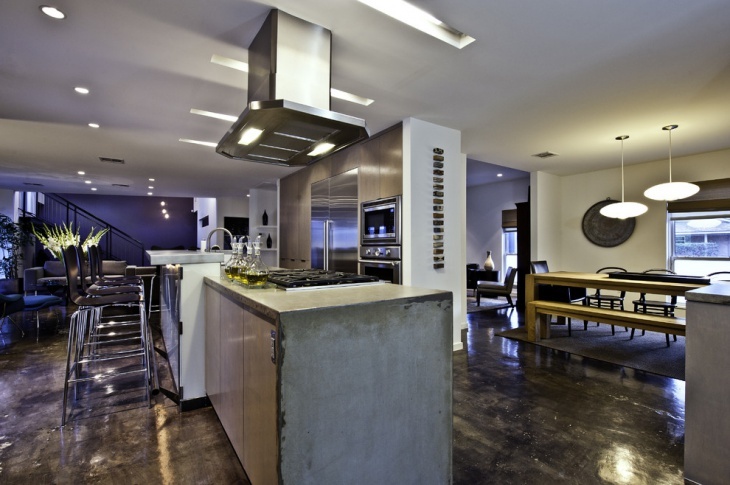 The grayness of the concrete flooring for this home interior is a good match to the black exposed beams on the ceiling. The fireplace wall is of light color and it balances off the whiteness of the rest of the room – ceiling, walls, and furnishings. The pillows on the couch and the artwork on the wall leading to the stairs provide dashes of colors here and there. Southern homes are known for their elegance and great interior design. For this southern home, those elements are very much present. 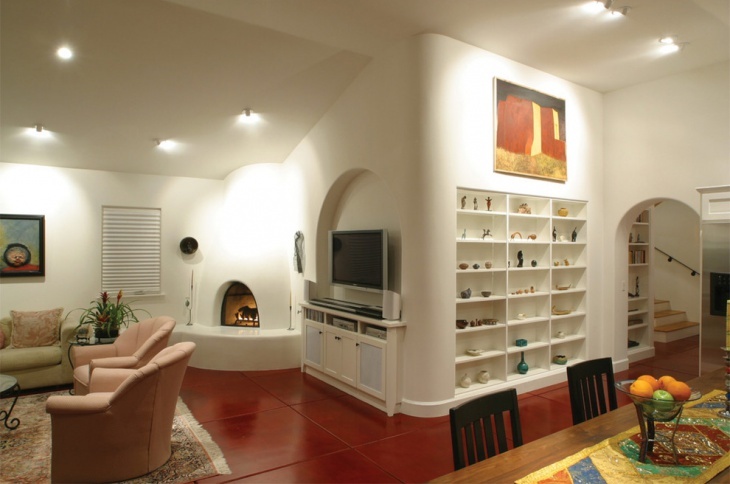 The red concrete flooring is an elegant base and it is matched by the pretty light colored rug in the living area. The rest of the interior is in white, making this home a beautifully designed masterpiece.